In the early part of this course, we will talk a lot about Teams. Teams are important. Why do you think this is so? Normally people in a company have skills, experience and abilities which complement each other. A company as a whole is complex - a set of systems with different functional experts in different areas. The areas complement each other and many have interactions. Quality affects manufacturing. Design affects quality. Quality affects design. 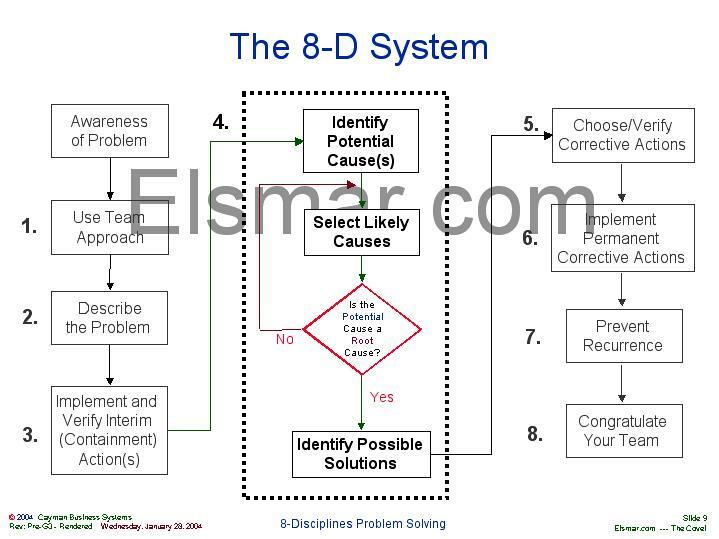 The 8-Disciplines methodology requires a team effort to ensure that there is communication between �interested parties� and that interactions are identified and effects assessed. Is the Potential Cause a Root Cause?